Newly renovated condominium. Tired of old, battered and worn kitchens and bathrooms? Ours are new. Kitchen fully stocked too, from muffin and cookie sheets and pans to margarita and martini glasses. Aggravated after opening the door and finding dirty tiles and/or smelly carpets? We have new tile throughout; clean and bright. Our bedding and linen is high quality, always clean and fresh. Navarre Beach is a unique location offering beautiful white sandy beaches and the clear emerald water of the Gulf of Mexico. It is a barrier island unspoiled by commercial development. The Navarre Beach Regency is a preferred location on the island. 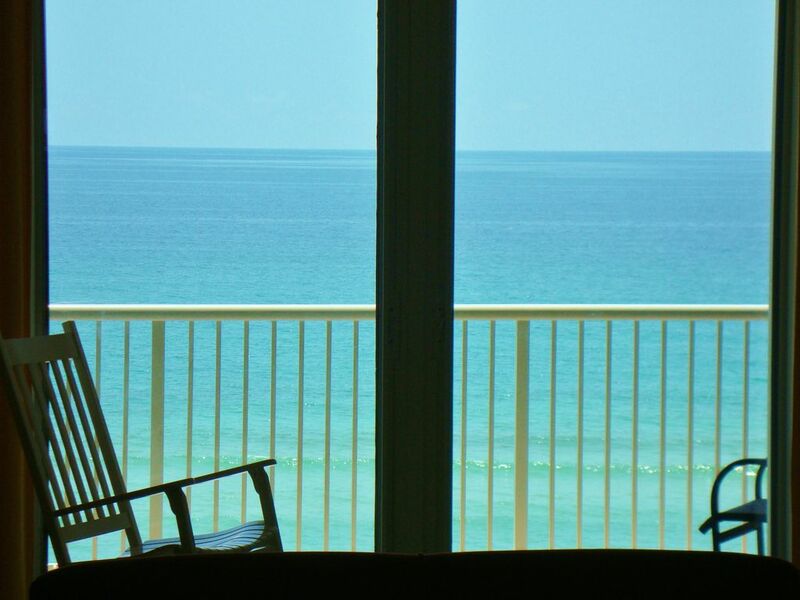 The Regency has the largest heated pool and the largest Gulf front balconies on Navarre Beach. The Regency boasts 400 feet of beach which makes our beach the least congested. There is plenty of beach so you will not feel crowded as you relax or play. A few steps to the north across Gulf Boulevard, you will find the serene waters of the Santa Rosa Sound, our inter-coastal waterway. Unit 412 is a corner unit with 1520 square feet of living area and three west-facing windows. These end unit windows provide a stream of sunlight as well as additional water views. The 9-foot ceilings compliment the floor-to-ceiling glass sliding doors in both the living room and the master bedroom suite. The unit boasts a master bedroom with a jacuzzi tub and separate large walk in shower. In addition, a newly renovated, well equipped kitchen serves the needs of any cook. Off the kitchen there is a large laundry room with a full sized washer and dryer. Both bathrooms are newly renovated. Enjoy the lifestyle of relaxed island living or workout in our new fitness center on the first floor. If needed, we provide bike storage and a storage area for beach equipment to avoid the hassle of transporting the equipment to and from the unit. The new pier which is a short walk along the beach offers a bar and grill. Bring your boat! There is a public boat launch located just across Gulf Boulevard. Remarkably decorated, this end unit comes complete with all you need plus a panoramic beach view! So call or email today and discover, 'one of Florida's best kept secrets.' Relax and play in Navarre Beach and create memories to last a lifetime! Please contact for any questions, concerns and additional details. Myself and my family are long time Navarre Beach visitors. We're intimately familiar with the area, we've had family living in Navarre for years. As Florida residents, we know Navarre Beach is unique in the State and we pride ourselves on keeping our beach home modern and clean. Fitness room on the first floor. Fully loaded kitchen includes everything needed to bake. Thirty foot, private balcony with Gulf views. Our condo is wheelchair accessible. The view is amazing and the condo is everything you would want in a homeaway from home. We just spent a week in this condo and we thoroughly enjoyed it. My favorite part was the balcony and the wall of windows. The sunsets and and sunrises are amazing here. Navarre is one of our favorite beaches because it is beautiful and not crowded. The condo is really nice and so are the grounds. There was someone working to keep things clean in the communal area every morning. The pool is really nice too. It had everything we needed. Overall the condo was clean. I would have liked to have a broom, but there is a little vacuum. The first night there I just went and got some house shoes cause I cant stand dirty feet, my husband just went with it. There is a Dollar General a few minutes down the road if you turn left coming off the Causeway and the Walmart is like 10/15 times if you turn right. Any information you need to know Tom is very good about getting back with you quickly. All you need is the entry code, you dont have to checkin anywhere so that is nice. If you get to looking for the info packets we found them in the drawer to the left of the oven. The thing to put in your car window is between the sink and fridge. We visited during the off season so the parking lot wasn't very busy. And to walk across the pier is only a $1 per person and you get a wrist band that last until 11pm the day you get it. We saw several sea turtles when we were walking across. I would recommend this condo to anyone, just bring a broom and do not forget your hair dryer ladies and bring trashbags and extra toilet paper. Best place in Navarre Beach! This condo has everything you need! The amount of space is perfect! All of the upgrades that Tom has made to the condo are wonderful! This is our second time staying here, and we can’t wait to go back! The best place, E V E R!! Perfect 4th floor location, lovely interoir that complimented the lucious view of the gulf, well-stocked, and spacious! A real retreat from the chaos of the working world! Beautiful condo. Great location. Adequately supplied kitchen. Comfy living room furniture. This was a beautiful place to stay. We all had a wonderful time. Perfect location, extremely clean and nice condo! This was our second time staying and love it here! Highly recommended! We will definitely be returning back! Blackwater River, 'ONLY pristine sand river left in the United States, so unique that the State of Florida purchased and designated it as a State Forest.' - tube, canoe, kayak, grill out, swim, fish. Water sports within walking distance. Prices are subject to change. 11.5% tax, an $80 cleaning fee as well as a deposit may be required and added to the total. Sorry, no pets and no smoking allowed.